The North West Cross Country, hosted by City of Derry Spartans took place on Saturday 16th December at Gransha Park. This event was also the latest in the Athletics NI Cross Country League. The snowfall and heavy rain of the previous week resulted in heavy going for competitors, but at least the icy conditions had been replaced with milder temperatures. In the junior races Springwell RC had success with Sophia Coyle winning the U12 girls and Niamh McGarry the U15 girls, in which Toni Donnelly finished 7th. In the Senior Race Springwell RC was well represented with 33 members competing. The 3 lap, 3.5 mile race was closely contested from the start between Neil Johnston (Springwell RC), Declan Reed and Mark Long (City of Derry Spartans), Chris McGuiness and Troy McGilloway (Foyle Valley AC) and James Budde (North Down AC). In the final lap Neil once again demonstrated the impressive form that has seen him secure victory in the Comber Cup and Malcolm Cup this year and pulled away from Declan to win in a time of 18.39. Declan finished second in 18.46 with Chris third in 19.02. The team event was even more closely contested with Foyle Valley AC winning by one point from Springwell RC. The ladies race was totally dominated by North Down AC who claimed all the podium places. Rachel Gibson secured victory in 21.52 with Katie Moore second with a time of 22.10 and club mate Sarah Lindsay completing the podium with a time of 22.24. Having taken the top three places North Down ladies easily won the team event from City of Derry Spartans in second place. The fourth race in event management company, Born 2 Run’s ‘Run Forest Run’ series took place on Saturday 16th December in Kilbroney Forest Park in Rostrevor. Over 500 runners travelled to the Kingdom of Mourne for these challenging 5 & 10k events, where each 5k lap incorporated over 100 metres of climbing. 10k - 168th Andrew Kincaid 55.26, 182nd Janet Patrick 56.14, 267th Deborah Archibald 1.02.04, 288th Catherine Byers 1.04.48. Saturday saw 52 Springwell RC members Parkrunning at 5 different venues with 2 personal bests recorded. Over 500 competitors took part in Drogheda and District AC’s Christmas 5k on Sunday 17th December. 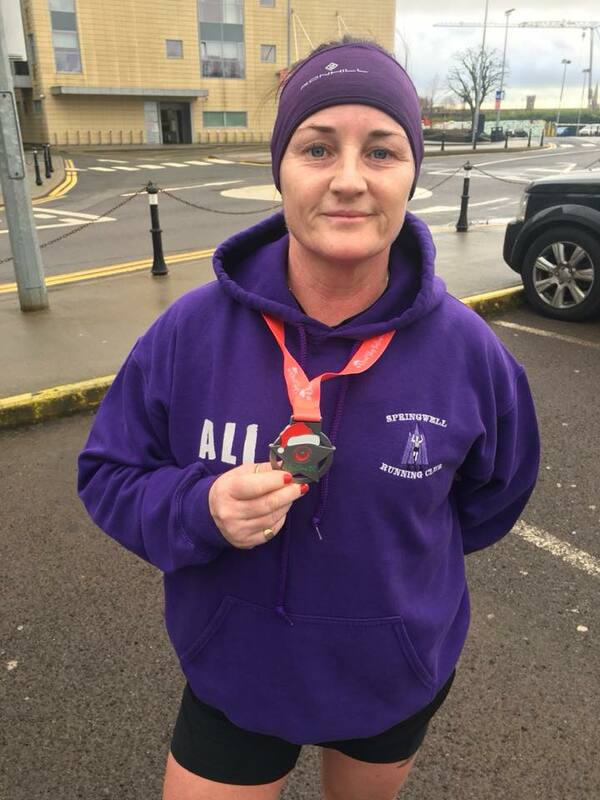 Springwell RC had one representative at the event with Alison McAllister recording her fastest 5k time of 2017, finishing 106th and 21st lady in a time of 23.46.